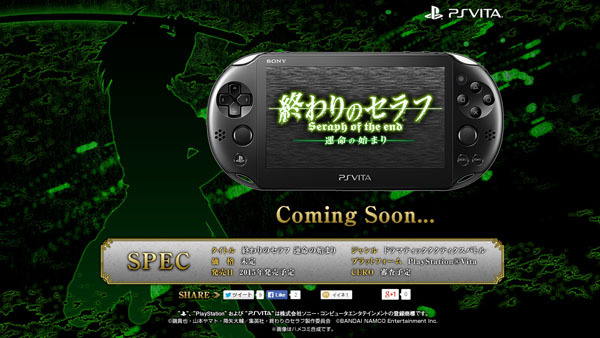 More anime titles for the Vita! Bandai Namco's Seraph of the End: The Origin of Fate is releasing in Japan later this year, but Bandai Namco has already seen fit to go ahead and launch the official teaser website. There's not too much going on over there, but it makes it very clear that this yet another addition to the Vita library that fans are likely going to want to eat right up. If you're a fan of the manga, this game will follow the series as well as the anime, and will supposedly tie in with the smartphone "military defense RPG" title Seraph of the End: Bloody Blade. The teaser website has gone up for that as well, but unfortunately we're a little bereft of additional details at the moment. What's noteworthy here is the continued dedication to populating what is, supposedly to many fans, a dying console that's not seeing many new releases. As demonstrated even on a weekly basis at Modojo here, we're constnatly seeing this isn't true. 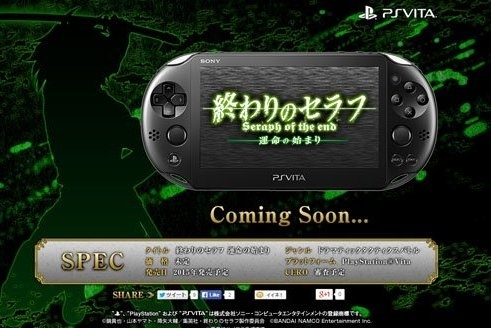 There's a new RPG or niche game announced for the Vita nearly every other day, or some details surrounding one, so we might as well call the Vita the niche machine for now and let it absolutely own that title. Anime-based games are right at home on it, so that's nothing to be ashamed of. Perhaps we'll get a Western release for Seraph of the End: The Origin of Fate because of that.